I'm NOT saying it's going to happen, but all things considered, I could see it happen. Edited 1 time(s). Last edit at 03/25/2018 06:23PM by Beeeej. Would be absolutely shocked if he doesn't come back next year, given that we are going to begin the season as legitimate national title contenders. Schafer's youngest child is Michelle, who is a sophomore at Penn State. I can’t believe that this is even thought about, say nothing about posting after the team played their hearts out and could have won. It seems every year there’s discussion about Schafer, but couldn’t we at least wait till the team gets back home? Unless A.N. decides to fire him and hire the hockey-equivalent of Matt Kerwick. Spoke to a cornell staffer at the game who said that Schaefer is apparently looking at a trip to play ASU next Christmas time. that's terrible for the ooc but not bad for avoiding the winter in ithaca. Edit: BTW, this is Greg, not Anne. I think you knew that. Edited 1 time(s). Last edit at 03/25/2018 12:44AM by Anne 85. Well, Anne is such a potty mouth. That's what you get for using Arabic to encrypt your password. I disagree with Mr Linsey on this one.. Retired jersey's are to honor one's accomplishments as a player. I watched all of Mike's home games and some road games... I can say that, from a fan's perspective, he was a very solid defenseman and clearly a leader on his teams. I believe they won one ECAC title during his time on The Hill. None of this is the makings of a outstanding playing career, just a very solid playing career. And, he is obviously a very solid person, off the ice!! As a coach, I have criticized him in the not-to-distant past. But, the play of the 2017-18 team has shown that Mike is, indeed, able to change with the times and has his team playing a style that involves more skating & skill... Love it!! Couple this with his past accomplishments as coach and it's clear that Mike deserves some great honor to be bestowed by the University, just not the uniform retirement. Spot on. Silly to retire his jersey, which should be reserved for an all-time great PLAYER. Schafer deserves to be honored for his coaching success, not for an excellent but not spectacular playing career. I'm not arguing this matter one way or the other, but there are obvious examples where retiring a jersey has not been "reserved for an all-time great player:" Red Auerbach, Casey Stengel, Walter Alston, Tommy LaSorda. There are others but I'm not going to bother looking them up. I think he deserves it. Hard to find people who have had such a sustained, profound impact on Cornell Hockey. I suspect he will be eternally honored in some form a few after he stops coaching - but I don’t know that it will be with his jersey retired. I just have trouble with calling Schafer the greatest coach in Cornell history. Titles matter and Harkness had 2 even if he was only here for 7 years. Jebus. Unretire the numbers. Have a “Wall of Honor” on the western end. Or a “Red Rafter of Glory.” Or something similar. This isn’t hard. This is the correct answer. Retired numbers are stupid. I'd argue it. What do you retire: Schafer's jersey? The stick he broke over his head to fire up the team as an undergrad? One of the suits he wore behind the bench - it isn't a trademark like Bear Bryant's hat or Red Auerbach's cigar. (Remember the joke about the shopkeeper with a big clock in the window, the customer comes in to get his watch repaired, the shopkeeper says I'm a mohel, the customer says why is a clock in the window, the mohel says, "So, you want I should put what in the window then?" Cultural appropriation. That was used during the Battle of Stalingrad. RPI got this (half) right. Instead of retiring numbers they have a "Ring of Honor". If I remember correctly they don't necessarily add to it every year. Their only mistake was the color. I wasn't a Crayola maven and hence can't tell you the color of the banners. Whatever the bizarre orange-red cloth used, it in no way matches the uniforms. RPI includes Harkness in their ring and it's surely appropriate to consider Ned and Mike for an honor. Much as I think that Union made a Messa their Achilles of a rink, I can't ignore the Red Berenson script on the ice at Yost. I believe we have a Cornell hockey HOF. Of course. What better honor, or stick to beat someone with, would there be than wearing #25? "Oh, you're Nieuwendyk, then? Better score, kid." Does Schafer still make players research someone who had their jersery number? Kinda dumb then to take away some of the best ones. RPI displays the ROH banners similarly to retired number displays. They also have an athletic HOF. We're long overdue for something like that to honor Ned at Lynah... I like it!! I am aware of that, Arthur.... But, something on/near the ice surface, visible during games would be nice. How about a recording during games: "Check, check, check, ... "? i will never understand why people get so wound up about some pedantic understanding of an issue that has no fixed definition. opposition to retiring numbers generally makes sense to me even though i don't agree with it (except in the nfl where numbers are actually a scarce resource because of position-related number rules). foot-stomping opposition to a former team captain and long-time successful coach getting his number retired as part of a way to honor his overall commitment to and success at the school does not. The Cowboys retired Landry's fedora. The Celtics retired Auerbach's cigar. The Lakers retired Hearn's mic. Schafer doesn't have an iconic image... but he does have a uniform number. If you want to retire his blood pressure I suppose that would also be OK.
Edited 1 time(s). Last edit at 05/07/2018 12:20PM by ugarte. Perhaps his stick curvature calipers? Telling my son about Billy Martin, George Brett and the pine tar game was one of the most fun things I've gotten to do as a parent. Someday I'll get to tell him about this. Since we have, and Schafer wants, limited numbers to pick from, we can't retire too many or we won't have them for players. If you don't want to retire jersey numbers then we should honor the folks with something very permanent....like stone monuments in the outfield of an historic building like Yankee Stadium. That will be there forever. Yes. We could put the monuments on the ice behind the west net. Would make quite the home ice advantage. I've wanted to put up a statue of Ned near the student entrance to Lynah and name the ice for Schafer. I've started some discussion about the statue, not with the ice. Statue would be nice for 2020 anniversary of 1970, and could honor Schafer at same time. 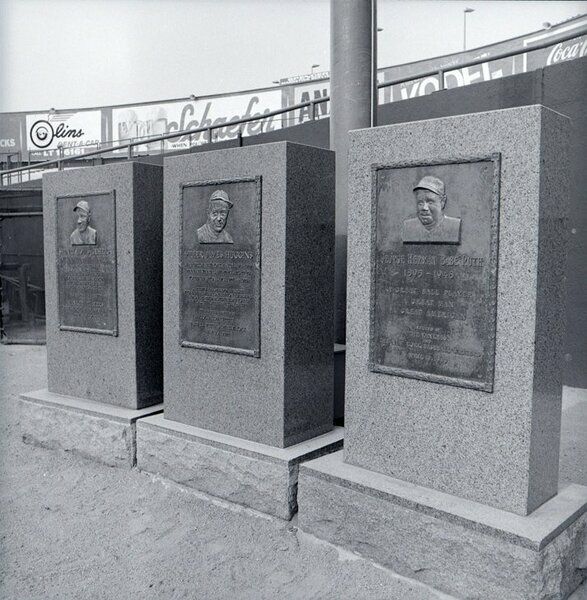 ,,, and to carry the analogy further along, there'd be a momument to the athletic directors at the time of Harkness and Schafer, and if it's anything like the Steinbrenner graven image, it'd tower over the players / coaches. But the Schaefer Beer sign towers above all....oh the irony (ignoring spelling guide). I wasn't sure where to put this but since this thread is about Schafer this will work. Has him listed with Hastings, Bazin, and Jackson as among the best options to go from college to pros. I doubt he'd leave but it was interesting. I'm not so sure. Schafer on a few occasions has expressed interest in someday coaching in the pros, and while I'm sure he'd prefer to leave with a NC under his belt, given that he's now 54 or so, I think if an NHL team came calling he'd have to take a shot. As for Quinn, he spent the past five seasons at the University of Boston, where he succeeded one of the greatest coaches of all time, Jack Parker. His highlight was 2014-15, when Jack Eichel won the Hobey Baker and the Terriers made the national championship game. Could have been worse. They could have had Quinn spending the past five seasons at "Boston College", which would not be the first time that confusion has come up. Yeah it's not great but again just thought it was interesting that they were even bringing Schafer up. I think if an NHL team came calling he'd have to check if his refrigerator was running.